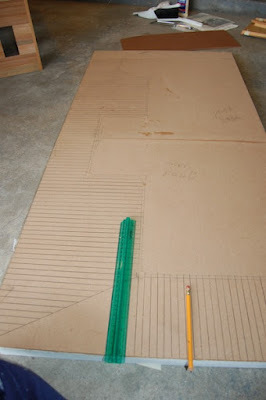 Let me introduce you all to yet another dollhouse that I am currently working on - The Dura Craft Mansion. 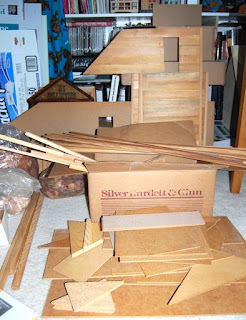 I know, I know, I know - I have a TON of dollhouses that I am working on at the same time. Whenever I get stuck with one I move onto the next and I find that gives me time to sort out the problems with the other houses. Last summer I was at a garage sale when I noticed a forlorn looking box with the word dollhouse on it and a tattered $20 price tag. I doubted that it was a whole dollhouse, but I thought that all the wood pieces would be good to supplement my other dollhouses. When I got home, I carefully went through the whole box and came across some instructions. It turns out that this is the Dura Craft Mansion. It even had a parts list, so for the next hour I carefully did an inventory. There were quite a few pieces missing, but I figured I could make them myself. The Dura Craft houses have the strangest construction I have ever come across. It basically consists of hundreds of little pieces of siding that you slot together in the corner trims. 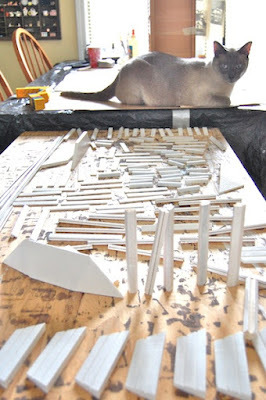 There are also a million pieces that had to be primed for the windows and porch railings. Once the basic walls were built, I was able to make a base. I scored the porch floor wood to look like boards, and I gave it a quick undercoat of brown paint. 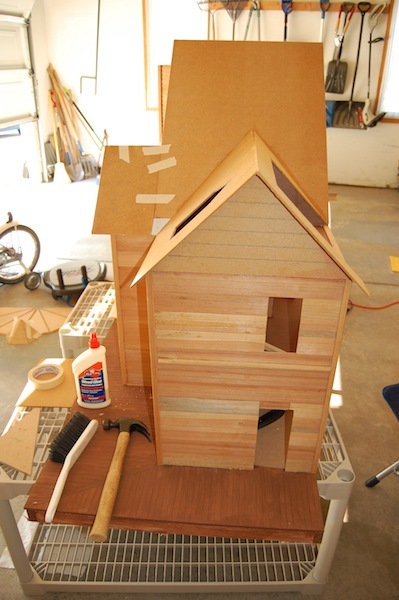 Well, I am really pleased with how this dollhouse has turned from a pile of wood into a house. Oh Sam what an awesome find! And you were the perfect person to find and rescue her! The house looks fantastic and so roomy! The porch is just charming, and your floorboards came out beautifully! I work in dollhouse jammies which display every color of the rainbow and globs from every sort of glue ever made! Yep, a miniaturist has to have a well worn, paint and glue covered "uniform"! Oh WOW this is fantastic! I think you've done an amazing job on this excellent find. I look forward to seeing it finished. And I loved seeing your 'helper', although I see he's not being at all helpful seeing as he's sleeping on the job! Thanks Sharon. My helper likes to sleep a lot, but he does make me laugh, and he is a great little buddy. What a great kit! The exterior is a beautiful design and the rooms look like they are all a very nice size. I can't wait to see how you transform and finish the kit. Thanks Giac. I really like the size of this house as it is big! Thanks Birgit. The price was really amazing for what it is. I love a good bargain, and this has been an interesting project so far. Well this was certainly a bargain find! You'd never find something like that her in Oz. Love that it has turret rooms and am looking forward to seeing this little baby painted. Hi Xanadu. Yeah, that is one thing I absolutely love about the USA - the amount of bargains that are available, especially in the doll and dollhouse arenas. I can't wait to see this finished either! This is a big house! Scoring the floor is a great idea. Your cat sure looks happy with this new project! Wow, this is a big house and a huge project! Mr. Nova seems quite pleased. Perhaps he will pass inspection on this on quickly so construction may continue. I assumed that he was just working on his inspection of the rails! Thanks Phyllis. Somehow I think Mr Nova's version of inspections have to do with the amount of sleep the construction entails. Only after a good nap do things pass around here!